From all we know of it so far, Ubisoft’s The Division 2 is a game about a secret government military force reactivated to take down a corrupt government setting itself up in the virus-stricken ruins of Washington DC. It’s also, according to Terry Spier, creative director at Red Storm Entertainment, “absolutely not” making any political statements. There’s nothing wrong with having a diverse design team, of course, but there’s something to be said about the overall trend of Ubisoft games, and AAA games in broadstroke, to shrink from comments regarding their relevance to contemporary sociopolitical contexts. The recent Wolfenstein games, or Hangar 13’s Mafia III, feel like standouts among their contemporaries, for little more than not ignoring their position in political conversations. 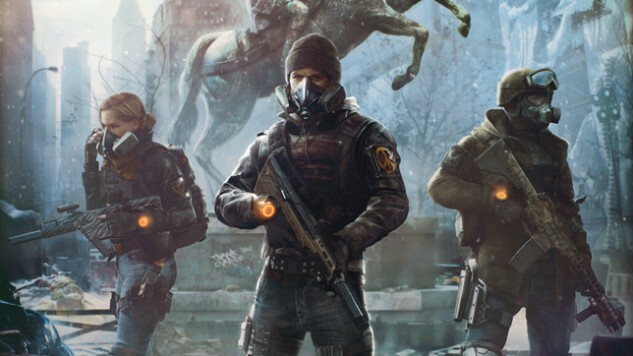 The Division 2, like any other videogame, was not developed in a vacuum. As the infamous disclaimer in front of the Assassin’s Creed games says, it was likely developed in a similar environment with a team large enough to come from various backgrounds, races, nationalities and religions. It cannot be “apolitical” any more than those people can be. But there is, of course, a reason that apoliticism is considered the optimal state for high-budget games, and it’s a rather straightforward one: Marketing a game as “apolitical” means that you aren’t going to worry any potential buyers. It’s a marketing response, not an ideological one. But that doesn’t mean it’s any less cowardly—it just makes it more palatable to stockholders. It’s possible that there are other members of the creative team behind The Division 2 that do honestly believe that the game is engaging in a political conversation, contrary to whatever Spiers says. By all accounts, the first game did not handle this well, but it’s possible we could see a more mature take on the various conflicts depicted in the game in the upcoming sequel. I’m not holding my breath, but it’s not outside the realm of possibility. What’s more troubling about Spiers’ statements is that they’re not uncommon. David Cage said about as much about Detroit: Become Human earlier this year. High budget AAA games’ refusal to engage with their own messages isn’t just frustrating, it’s ignorant—both of their own position in the world of games and art, and also of their position in politics. In my more optimistic moments, I think that we have comfortably moved beyond the argument of whether or not games are art. I think that, broadly, the consensus is that they are, in some definition or another. The particulars aren’t that important. But what is important is that if we acknowledge that games are art—that is, that they are pieces of artistic creation worthy of critique, study and dissection—we cannot ignore that they are political by nature. The things that Spiers defines as “not political” in his interview (namely, “supporting communities” in the wake of destruction, taking on corrupt governments, and building support for a just cause) are in themselves political actions. Not to draw an extreme comparison, but the Black Panthers made much of their public support campaigns primarily through public meal programs. It would be an absurd statement to call those “apolitical actions,” so why do we expect that from games? Why do we assume that games have some sort of vaulted position above other artforms that allow them to touch on, but not be a part of, political discussion? It might seem like I’m taking an exaggerated stance here, and to be honest I sort of am—I don’t expect The Division 2 to make any sweeping gestures about the specific causes of American corruption. Nor do I think it necessarily has to. But it’s the assumption that AAA games must by nature be “non-political,” that they cannot take stances or provoke possible buyers, that puts such a bad taste in my mouth. When Spiers (or Cage, for that matter) acts surprised that one might call their work political, it speaks at least partially to the marketing reticence I brought up above, but it could lead to a much worse place—one where games are broadly considered popcorn fare, unsuitable for a critical eye. If that sounds familiar, it should. It’s the same fear that loomed over games during the harrowing decades of endless “but are they art” arguments. Let’s not repeat the same mistakes when we’re talking politics. If games are art, and art is political, then games are political.